He has no ties to Buffalo, no memories of the skies glowing red when Bethlehem dumped its slag into Lake Erie, no nostalgia for childhood trips downtown to see the Christmas windows in AM&A’s. Yet Spencer Morgan, ’12, has fallen in love with Buffalo. He sees it as a growing place with a bright future—partly because of its past, and partly because of its unique character that owes a lot to the city’s blue-collar roots. Morgan is the curator of the museum, which recently moved to the Heritage Discovery Center, a building at 100 Lee Street that’s owned by the Western New York Railway Historical Society. The idea of a “heritage discovery center” is close to Morgan’s heart. “Museums show what ordinary people went through,” he said. The museum’s current exhibit underlines Morgan’s point. From the baskets that once contained steelworkers’ personal items—they were hoisted to the ceiling and locked while the men worked—to the salt pills they took to replace salt lost while working near red-hot steel, visitors are connected to a way of life that made Western New York the steel-making capital of the world a mere 100 years ago. Images show steelworkers’ families tending garden plots owned by Bethlehem Steel and workers standing just a few feet away from molten steel inside the plant. 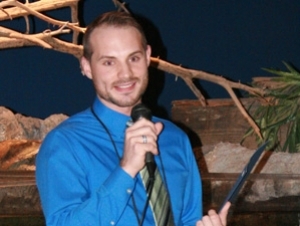 Spencer discovered his love of museums when he interned at the Barker Historical Museum as part of earning his bachelor’s degree in history at SUNY Fredonia. He applied to Buffalo State’s museum studies graduate program, where he completed an internship at the Steel Plant Museum. Megan Hahin, a graduate student in the museum studies master’s program, has prepared a new exhibit, The Art of Steel as Seen through the Eyes of Norman Rockwell. It’s scheduled to open in April. “The exhibit will show rare prints of a series of paintings by Norman Rockwell,” said Morgan. The paintings were commissioned by the Sharon Steel Corporation in 1966 for a company booklet.